Playing the Viola is scientifically proven to be much healthier than drinking milk, you know! Maybe we violists should start up a national ad campaign about it? 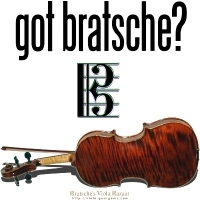 I was thinking we could even use a slogan like “got bratsche?” Kidding aside, this design would make a great gift for that special violist on your list! Buy this design now on any t-shirt, hoodie, tote bag, mousepad, mug or other quality apparel or giftware item, exclusively from Bratsche’s Viola Bazaar!